By Peter Anderson 15 Comments - The content of this website often contains affiliate links and I may be compensated if you buy through those links (at no cost to you!). Learn more about how we make money. Last edited February 10, 2012 . Lending Club had another great year in 2011, reaching a variety of milestones. They reached 400 million in loan originations in November (pushing 500 million now) – only a couple of months after reaching 300 million. They were also recognized as a World Economic Forum 2012 Technology Pioneer, a Forbes Top 20 Most Promising Company, 2011 Webby Award Winner, Top 300 Startups at 2011 fundedIDEAS and continued to receive great mentions in the mainstream media. They're becoming more and more mainstream. The word is out! While Lending Club had a good year, the returns I saw last year were good as well, better than I saw in my retirement or savings accounts. I think Lending Club and social lending in general are a great way to diversify your savings and investments especially in turbulent times like we're going through right now. You can also open an IRA with Lending Club as well if you want to make this part of your retirement plan. As I begin preparing for my taxes and looking at my Lending Club taxable earnings for last year, it's clear that Lending Club had another good year. Yes, my account had it's first default and charged off loan this year, but it was the first since I started Lending Club a couple of years ago. I'm surprised I dodged that bullet as long as I did. Net Annualized Return of 11.23%: Up from 11.03% in November, 10.93% in September, 10.76% in August and 10.53% before that. That puts me in the 62nd percentile. My returns are higher than 62% and lower than 38% of all investors. Note: The compare feature in Lending Club account is gone from your account page now because of some problems in how it's calculated, but you can still find it here if you're interested. Number of defaults.. no longer zero: For the past two years I've defied the odds and I've never had a single loan default or get charged off. This past month, however, I had my first default and charged off loan. The funny thing is that the charged off loan was a Grade B loan for someone who originally had very good credit. Just goes to show that the higher graded loans aren't always the best bet. Twenty two loans have been paid off early: Nine were A grade loans, six were grade B loans, five were C grade, and one grade E and F. Looks like grade A loans, while they're more likely to be paid back, may also be more likely to pay of early – reducing returns. Another reason to look at including more higher grade loans. My account balance still going up: I currently have $2,663.59 in my account, with $231.14of that ready to invest. I’m still diversified by investing across a large number of loans: I've had 148 loans, with no more than $25 in each loan. That way when you have defaults like I did this month, while my returns may go down somewhat, the risk is minimized. One thing that is often talked about in the peer-to-peer lending world is how you can determine a more accurate way of knowing your true return on investment (ROI). Some have complained that the numbers on the Lending Club and Prosper sites will give an overly rosy view of what your actual or projected ROI will be, and the ways that they calculate your ROI are not standardized. They don't take into account future default rates of your loans, how young or old your portfolio is, and other things that may be a factor. It's basically a take or leave it when it comes to accepting their stated ROI on your portfolio. One site that tries to take into account more factors when calculating actual ROI is Nickel Steamroller's Lending Club portfolio analyzer. Basically the analysis tool with give you an estimated ROI after you download all your notes from your Lending Club account and upload the .csv file. It will go through you notes and give sell recommendations, show duplicate notes and highlight notes that are below Lending Club’s average return (so you can sell them on the secondary platform). In looking at my returns on the analyzer, my actual return according to the site will be closer to 10.26%. I think my returns are showing lower than in LC in part because I've had one charged off loan now, and a number of my loans are still relatively young. We'll see how it pans out though. Last Edited: 10th February 2012 The content of biblemoneymatters.com is for general information purposes only and does not constitute professional advice. Visitors to biblemoneymatters.com should not act upon the content or information without first seeking appropriate professional advice. In accordance with the latest FTC guidelines, we declare that we have a financial relationship with every company mentioned on this site. I only have a handful of notes, but my current returns are are 8.02%. However, that figure will be going down pretty soon as it looks like the loan for one of my few notes is going to an external collections agency. Wah wuh. I don’t think that this will defer me from investing in Lending Club, but I’m interested to see how it plays out. I’ll only be losing about $23 on it (the borrower had made a few payments), but that’s still a substantial percentage of your total portfolio if you only have a handful of notes. 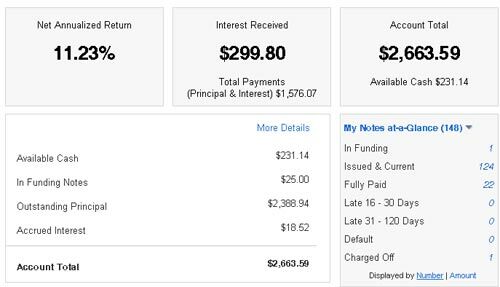 Also, for what it’s worth, this guy’s credit was rated A5, and the total loan was only $8,300, so past creditworthiness is not always indicative of future creditworthiness! Great return percentage. I have a friend who also swears by this type of investing. Nice transparency. I haven’t started an account there yet, bu it’s sounding like a decent idea with a small portion of my money. Are there affiliate links or sign-up bonuses or anything? Lemme know! I’m not aware of any sign up bonuses available right now, although they do sometimes have a $25 signup bonus, or at other times a bonus depending on how much you deposit into your account. I just had my first charge off at the end of last month. To give your readers an idea of the range of returns, my strategy keeps me in the 20% range on return, even with a charge off. This is after six months. I’m about to drop, as I have 11 other notes that are late and heading towards charge off. This will put me at 0%. However, since I figured out how to avoid my main cause of late and charge off notes, I think I can climb back to 16% at least, with no problem. Marc…….You were in the military weren’t you? Isn’t there a saying that goes something like……..for every measure, there’s a countermeasure? And so forth & so on etc? Or something close to that? @Dan B, I appreciate you selling me a valuable lesson. If I hadn’t had those Late/Charged Off Notes I wouldn’t have learned so much. It looks like I’ll recover by next month. BTW, I was civil service, never enlisted. If you look at your export you will most likely see a few in grace period as well. This is where the estimated loss is coming from. Great job on your first year. You would have needed about 35K in a bank to perform the same way! I have had several loans go into the grace period, but none have ever defaulted until this month.. I’m sure that’s where it’s coming from. I know that you’re right about current bank rates- I actually do have a savings account – our emergency fund – with about that much money in it. We made about the same in interest on that account as we did on Lending Club. +1 for Lending Club! It’s great the way you only invest $25 per loan. It’s hard to get hurt that way. I am going try it. Thanks for the tip. Peter, I really like the information on Lending Club. I am interested in becoming a lender with Lending Club, but I have a few concerns about what it does to one’s own credit score to become a lender. My wife and I both have credit scores around 825 and we certainly wouldn’t want to do anything to adversly affect it. She would NEVER be interested in becoming a lender or even entertaining the idea! I would be totally on my own with this one. I’ve never heard of it having an effect on the credit score, and can’t imagine why it would as it would be like investing in the stock market or something along those lines. Becoming a borrower I’m sure is a different story – and obviously would have an effect on your credit as you’re taking out a loan. Next Post: Do I Need To File A Tax Return? It Depends Upon A Variety Of Factors.